Summer is just the time to kick back and sip cool cocktails with friends. In that spirit, we’ve gathered together five of our favorite Greek cocktail recipes to share with you! This lovely brings the taste of mastiha, a gum like resin from Chios – my dad’s side of the family is from Chios so this one is a family favorite! Muddle grapes and mint leaves in a cocktail shaker. Add the remaining ingredients with ice and shake vigorously. 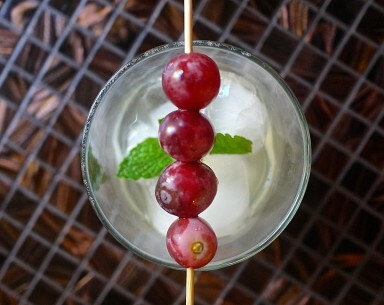 Strain and serve over ice and garnish with grapes and mint leaves. For you mojito lovers, this is muddling magnificence my friends – that’s all I can say. Actually, I can say more, much much more about the amazingness here but I’ll let you just taste it instead! In a cocktail shaker, muddle the mint with the brown sugar and lime juice. Add the Metaxa, lemon juice and ice. Shake well and strain into an ice-filled highball glass. Top with the club soda. Try a Santorini Sunrise and you’ll know a real taste of heaven. An especially pretty drink, I’ve enjoyed this cocktail at Molyvos in NYC a number of times and it never disappoints. Found the recipe in Saver Magazine a couple of years ago and it’s become a party staple around here! In a highball glass, muddle seven of the quartered grapefruit slices together with mint and honey. Fill with ice; add vodka, juice, and Campari and stir. Garnish with remaining quarter slice of grapefruit and additional mint leaves. I first found this beautiful brandy based drink back a few years ago in an old issue of Imbibe Magazine. The original recipe includes one egg white and though it has been suggested to me that aquafaba might be the perfect substitute here, I simply omit the egg white with wonderful, albeit less fizzy, results. Dry shake (meaning, shake without ice) the Metaxa with the blood orange juice for 20 seconds. Then add ice and the cinnamon bark syrup to the shaker and shake vigorously for 20 seconds. Strain into a glass and top with club soda. Add the twist by squeezing the peel side down atop the drink and rubbing around the rim. Lay the cinnamon stick across the top of the glass. Mix water, sugar and cinnamon sticks in a small saucepan and heat on high until sugar dissolves, then simmer for 5 minutes. Discard cinnamon sticks, cool and bottle. Refrigerate for up to two weeks. Ok, this may not sound very inspired but it IS fun and pretty traditional really. Couldn’t be simpler and, yes, it’s sweet but not in an overly so way. The licorice of the ouzo just goes so well with whatever the crazy-chemical flavors in Coke. You must serve this over ice though and I do suggest letting it sit for a bit to just every so slightly water down the drink. Worth going out and buying a can of Coke for! Combine and serve over ice in tumbler.